Most of us cannot imagine how we'd cope without Google, YouTube, Facebook and Twitter. What keeps all of these coming into our lives for free? It's the same thing that's kept magazine, newspapers, television and other news services alive for many years: advertising. Yes, you can easily block the ads on Google, YouTube, Facebook and Twitter, but please consider the outcome if everyone does that. All those services — and IntMath as well — would disappear. An object going around a circle has both an angular velocity (the amount of turn per time) and a linear velocity (the familiar distance per time). Face detection is a fast growing research area because of its many applications in the security arena. On that page there's also "Face verification" to detect if 2 photos are of the same person, and also video face analysis near the bottom. This could make a motivating class project on data gathering and intepretation. WIRIS Calc (which I reported on earlier) is now in beta. This simple to use online computer algebra system has a lot of promise in an increasingly competitive field. It will solve problems in algebra, calculus and logic, and will also draw graphs. You can also save your worksheet to your local computer, to the Cloud, or as a PDF. Here's the documentation. As I write, the debate about which US election conspiracy theory to believe continues to rage. From an early age, we look for patterns and usually the ones we find are actually there. But an interesting field of mathematics looks at how easy it is to find patterns just about anywhere, even where none were intended. This TED-Ed lesson explains how Ramsey Theory works. If you can vote in this, the worst election in living memory, please do. a. Bus route problem: The earlier problem (in the 29 Aug 2016 Newsletter) has been solved! Narendrakumar got the correct number of bus routes. b. Domino puzzle: The puzzle in the last IntMath Newsletter asked about the sum of the fractions formed by the tiles in a domino set. A sheep is placed in a circular fenced pen where it can chew grass all day. The farmer wants to make sure there is enough grass left in the pen for the following day, so she ties the sheep to one of the fence posts using a rope. How long does the rope have to be so the sheep can only eat half of the grass? From the moment we're born, we start learning to respond to the things lfe throws at us. How much better off we'd all be if we saw each bad (and good) experience as a learning opportunity. It's all in our approach. I look forward to the solution for the sheep problem. It did my head in. Problem: construct a little circle inside a bigger circle so that the area of the little circle is 1/2 the area of the larger circle. The area of the large circle is defined as: A=(pi)(R*R) where R is its radius. The area of the smaller circle will be A(little)= (pi)(R(little)*R(little). 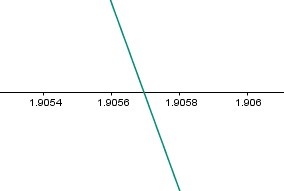 Substituting we find that R(little)=R/(square root of 2); which is approximately R/1.414. So, from any point on the large circle, we would follow on a straight line to a point that equals R/1.414; take one of the fence posts from the enclosure and put it at that point, secure the goat with a corresponding length of rope. Parenthetically, on the second day, the farmer can replace the fence post and let the goat run free inside the larger circular enclosure. 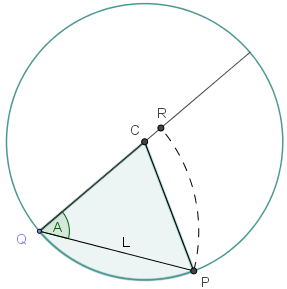 We need to find the length of a rope L so that the shaded area is half the total area of the circle. 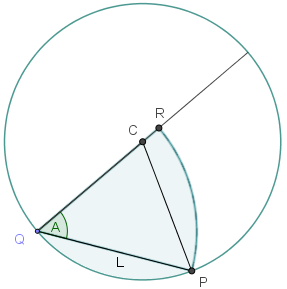 Draw a circle of unit radius (If radius is r it will cancel out anyway) and centre C.
Call one end of the diameter Q. Let QP be the required radius, where P is on the circle. 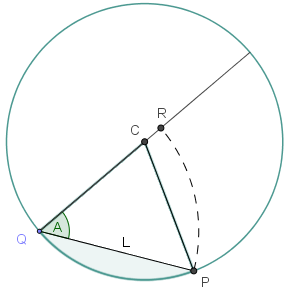 With Q as centre and L as radius draw an arc inside the circle to cut the diameter at R.
Join Q to P and join P to C.
Angle PQC = Angle QPC = A, say. where a is the length of the side opposite angle A, b is the length opposite B and c is the length opposite C.
Now I did a spreadsheet on solving this equation by Newton Raphson Method. 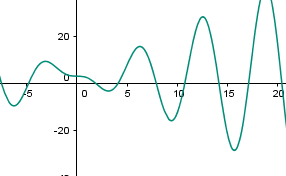 Zooming in on the only feasible (realistic) solution for this problem, we see the curve cuts the x-axis near x = 1.9057, which is the same answer as we had before to 4 decimal places, and our length L will be the same at 1.16 m.
A different approach: Measure the heart girth of the goat. Although its' cross section will be ellipsoid, for a conservative approach assume that it is circular; find its' diameter and let that be represented by G. This would be the distance between two parallel constraints (such as slats) that would prevent the insertion of the object with this particular diameter. Let the height of the fence be represented by H...divide H by G to obtain the number of parallel constraints. The diameter of the fenced in area is represented by D...so, we will need to take the number of parallel constraints multiplied by D and add the product of( the number of parallel constraints ) and G to get the total length of the rope needed to pen in the goat. Tie one end of the rope to a fence post at a height of G above the ground, extend the rope to a directly opposite fence post post, continue the rope to a height of G above the first line or rope and return it to the directly opposite fence post, etc. By the way, goats prefer more fibrous material than lush grass. (I hope this makes sense). Glad to see there was no easy way. Well, there is no good answer. If the farmer has a very large pen, maybe half a million hectares as per some Australian stations, a standard unit Australian goat just cannot eat half the grass that grows in it in a day. A correct answer should surely have some mathematical function showing dependency on size of pen and indeed density and quality of grass if need be, given standard unit Australian goat? @Bob: You're right! Perhaps we should have added at least a range of values for the radius of the pen, and a related value of the carrying capacity of the pen. Tomas Garza sent me his solution done using Mathematica. It was an interactive solution and the image shows the situation (r = 1.159) when the sheep can chew half the area of the blue circular pen. 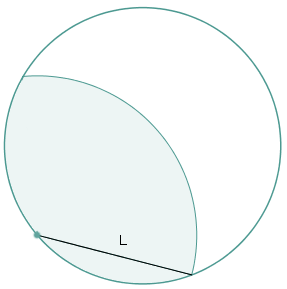 Let R=radius of cir fence and l= radius of "circle" to be found. Consider the chord C (extending between two intersection of the "circles" R and l. Let theta be angle formed from center of fence circle(between 2 radius and alpha, the angle centered on the fence circle by two segements of length l.
alpha to find the l which satisfies the 1/2 area conditon. 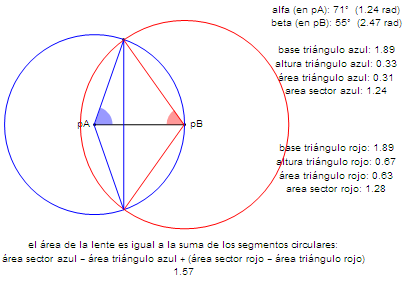 We can integrate the area under the two circles and solve for r such that area in both circles is half that in the pen. We want to integrate under the area of the small circle until the two circles intersect, and then under the larger circle until it crosses the x-axis (at r). It's still a bit tricky because the variable we want to solve for is in the limit. But it can be done with two functions for the integrands in terms of r. We can then integrate and solve for r with a reasonable starting guess of 1. @Chris: Good on you for having another go at this! Thanks also for including how you went about it - it's useful for others. Your solution looks good! Another answer for you, by my daughter-in-law, who has a 1st Class Honours Degree in Maths and Physics and thus is far better at such things than. The length of the rope needs to be the diametre of the pen. Tie the rope across the diametre of the pen in such a way that the sheep neither wishes to jump over it nor crawl under it, thus assuming that there is enough grass in half the pen to keep it from being hungry. A bit of lateral thought there.